The couching has turned out to be kind of wavy and the middle petal of the flower on the left has gaps. I think I did not lay the foundation stitches well. The colors look a little dull,but the overall effect is fine. I've used straight couching stitches over the foundation to tie it down . But there are a lot of other methods too - for instance, you could use split stitch or plaited stitch . The threads used are usually heavy. In my case, I tried silk without even practising the method once..duh!!! 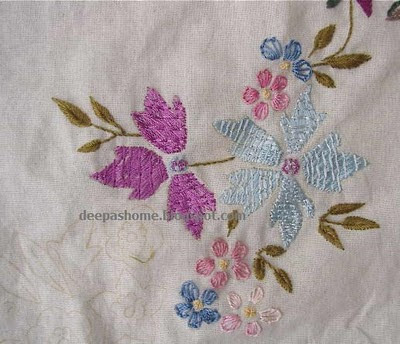 The leaves are stitched with alternate satin stitch and the flowers are blanket stitched with perle cotton. Thank you Meri, for the inspiration ...and thank you all for visiting inspite of my irregular posts. Deepa! This is so pretty! I'm glad you've tried Ponto Castelo Branco. And I have an old book that shows the way to stitch Ponto Castelo Branco just like in your link to plaited stitch - and the book says that is the way one can save the expensive silks used in that kind of embroidery!!! Gorgeous! And the colours are lovely. You are sure moving along fast on this... only five block to go, you must be very excited! Hugs. Hi, Deepa, I was on the link that you give; very interesting plaited st! Is it not too difficult or long? Yes, we are connected :) Isn't it wonderful!!! I did try plaited stitch for this block initially, and yes there is a starting trouble.The stitch doesn't look very elegant,it reminded me of weaving.I think I'll try again in some other piece. Hi Deepa ... Your work is so pretty! Although I have fancied being a hobby embroideress(?) since I was in high school, it is now that I am really picking up my threads! I think your site will help me find my way too .. :-) I loved your Chemanthi tutorial too ... it looks beautiful. Have you tried the Kashmiri stitch? 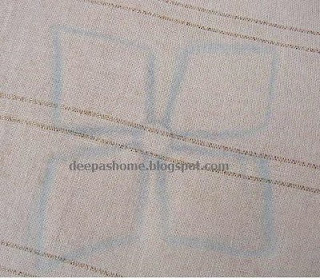 When I looked it up online it mostly shows fly stitch which is totally not Kashmiri stitch at all!! Have a good day! !